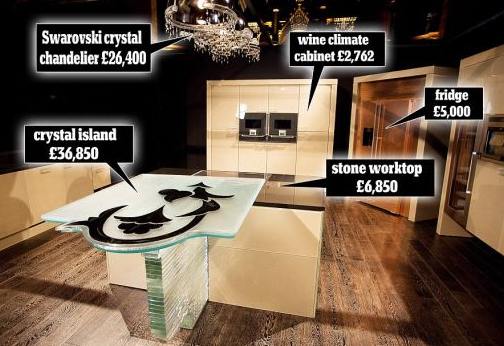 Check out the world’s most expensive kitchen, with sparkling chandeliers and a marble designed table. Now, wouldn’t you like to fry an omelette in this kitchen? The world’s most expensive kitchen is named the ‘Fiore di Cristallo’, and costs a huge One Million UK Pounds. It is designed by Claudio Celiberti, a UK-based interior designer, who is renowned for creating customised luxury interiors and exteriors, for billionaire homes. The ‘Fiore de Cristallo’ was launched by Aldo Zilli, the famous Italian celebrity chef at a party held at the One Mayfair in London. It took more than a year to make, and was handcrafted using the finest natural materials (like the Crystal of Murano), design qualities and craftsmanship. This luxury kitchen is more than a functional kitchen, it is also a majestic work of art, that is sure to be bought by high net-worth individuals. It has a flamboyant cooking space, solid copper walls, a crystal chandelier dangling from the ceiling and a range of select kitchen appliances. 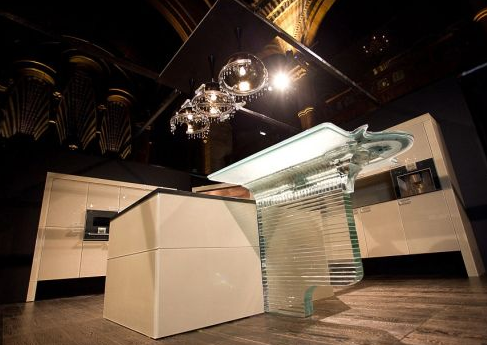 All the 27 cabinets in the Fiore di Cristallo luxury kitchen are fitted with Murano crystal handles, and have doors made of crystal that are 9mm thick. The focal point of the Fiore di Cristallo luxury kitchen is a crystal island costing $59,100, which is lit up by a sparkling Swarovski Crystal chandelier estimated at $42,350. The handmade German kitchen appliances are believed to cost around $38,500, while the stone workshop stretch is estimated to cost $10,990. In addition, the basin made of crystal is valued at $4,300, while the classy Philip Starck taps are believed to cost $2,570. If you want to buy one of these luxury kitchens, you’ll have to make a booking in advance, as there is already an eight-month long waiting list. What do you think of the Fiore di Cristallo luxury kitchen? Would you buy it for the sale price of £1 Million?